Cataracts can be a really bothersome eye problem. Well for once, people who have cataracts will have white and cloudy eye lenses making them look quite unaesthetic. In addition, having cataracts can really affect your vision making it look hazy and even giving it a brown or yellow tint. There are patients who may not really be affected yet with cataracts but that is usually due to it being in the early stage. Once the cataract develops even further it will need treatment. Today, we are going to take a look at the common questions that people have about cataract treatments and Cataract Surgery. 1.) “How are cataracts being treated?” – The symptoms of early stages of cataracts can be solves simply with new prescription glasses, special anti-glare sunglasses, and having better lighting. But the best way to really treat cataracts is through cataract surgery. 2.) “Is cataract surgery really effective?” – The removal of cataracts is actually one of the most common surgical procedures performed in the US. In addition, cataract surgery is considered one of the most safe and effective surgical procedures out there. 3.) “Are there any risks to cataract surgery?” – Just like any other surgery, there are risks. 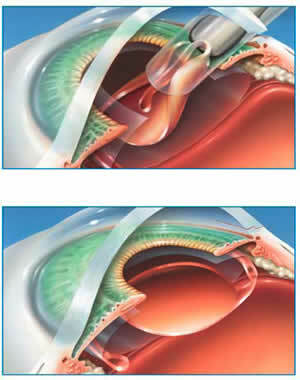 In cataract surgery, there is a risk of bleeding and infection. To solve this doctors recommend avoiding certain medication and taking antibiotics. 4.) “What if I suffer from other eye conditions other than cataracts?” – A lot of patients who suffer from cataracts also suffer from other eye conditions. If you want to undergo Cataract Surgery, make sure you discuss any other conditions with your doctor. 5.) “What happens before the surgery?” – Around a week before the surgery, the eye doctor will conducts some tests to measure the cornea and other dimensions of the eye to determine the proper intraocular lens. 6.) “What goes on during the surgery?” – The doctor removes the affected lens or cataract and replaces it with an artificial lens which is done after the eyes are numbed and the patient is sedated. 7.) “What happens after the surgery is done?” – After surgery the patient may experience itching and fluid discharge but must not worry these are normal. It is important to see the doctor from time to time. 8.) “Can complications happen after cataract surgery?” – Complications after surgery are very rare. This includes infection, inflammation, bleeding, double vision, low or high pressure in the eye or even a loss of vision. 9.) “How long until vision returns to normal?” – After surgery your vision will still be blurry. Vision will only become clear after a few weeks or months after the eyes have healed well enough. 10.) “What if I already lost my vision a bit?” – If you have already lost vision to your cataracts before undergoing Cataract Surgery, make sure you discuss things with your eye surgeon or doctor beforehand. 11.) “What should I do to protect my vision?” – One can wear sunglasses or a brimmed hat to prevent UV light from hitting one’s eyes preventing any eye complications like cataracts that can develop. ← The four services your Denver marketing company should offer.